IF YOU want to understand the policy of a country, look at the map - as Napoleon recommended. 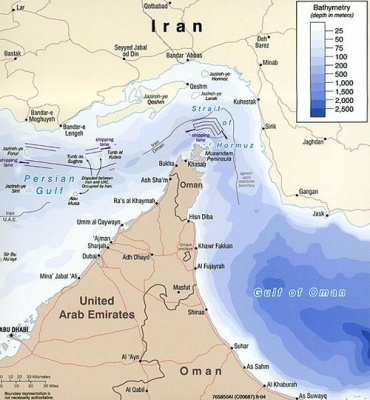 Anyone who wants to guess whether Israel and/or the United States are going to attack Iran should look at the map of the Strait of Hormuz between Iran and the Arabian Peninsula. Through this narrow waterway, only 34 km wide, pass the ships that carry between a fifth and a third of the world's oil, including that from Iran, Iraq, Saudi Arabia, Kuwait, Qatar and Bahrain. MOST OF the commentators who talk about the inevitable American and Israeli attack on Iran do not take account of this map. There is talk about a "sterile", a "surgical" air strike. The mighty air fleet of the United States will take off from the aircraft carriers already stationed in the Persian Gulf and the American air bases dispersed throughout the region and bomb all the nuclear sites of Iran - and on this happy occasion also bomb government institutions, army installations, industrial centers and anything else they might fancy. They will use bombs that can penetrate deep into the ground. Simple, quick and elegant - one blow and bye-bye Iran, bye-bye ayatollahs, bye-bye Ahmadinejad. If Israel attacks alone, the blow will be more modest. The most the attackers can hope for is the destruction of the main nuclear sites and a safe return. I have a modest request: before you start, please look at the map once more, at the Strait named (probably) after the god of Zarathustra. THE INEVITABLE reaction to the bombing of Iran will be the blocking of this Strait. That should have been self-evident even without the explicit declaration by one of Iran's highest ranking generals a few days ago. Iran dominates the whole length of the Strait. They can seal it hermetically with their missiles and artillery, both land based and naval. If that happens, the price of oil will skyrocket - far beyond the 200 dollars-per-barrel that pessimists dread now. That will cause a chain reaction: a world-wide depression, the collapse of whole industries and a catastrophic rise in unemployment in America, Europe and Japan. In order to avert this danger, the Americans would need to conquer parts of Iran - perhaps the whole of this large country. The US does not have at its disposal even a small part of the forces they would need. Practically all their land forces are tied down in Iraq and Afghanistan. The mighty American navy is menacing Iran - but the moment the Strait is closed, it will itself resemble those model ships in bottles. Perhaps it is this danger that made the navy chiefs extricate the nuclear-powered aircraft carrier Abraham Lincoln from the Persian Gulf this week, ostensibly because of the situation in Pakistan. This leaves the possibility that the US will act by proxy. Israel will attack, and this will not officially involve the US, which will deny any responsibility. Indeed? Iran has already announced that it would consider an Israeli attack as an American operation, and act as if it had been directly attacked by the US. That is logical. NO ISRAELI government would ever consider the possibility of starting such an operation without the explicit and unreserved agreement of the US. Such a confirmation will not be forthcoming. So what are all these exercises, which generate such dramatic headlines in the international media? The Israeli Air Force has held exercises at a distance of 1500 km from our shores. The Iranians have responded with test firings of their Shihab missiles, which have a similar range. Once, such activities were called "saber rattling", nowadays the preferred term is "psychological warfare". They are good for failed politicians with domestic needs, to divert attention, to scare citizens. They also make excellent television. But simple common sense tells us that whoever plans a surprise strike does not proclaim this from the rooftops. Menachem Begin did not stage public exercises before sending the bombers to destroy the Iraqi reactor, and even Ehud Olmert did not make a speech about his intention to bomb a mysterious building in Syria. SINCE KING Cyrus the Great, the founder of the Persian Empire some 2500 years ago, who allowed the Israelite exiles in Babylon to return to Jerusalem and build a temple there, Israeli-Persian relations have their ups and downs. The Shah helped to infiltrate Israeli army officers into the Kurdish part of Iraq, where they assisted Mustafa Barzani's revolt against Saddam Hussein. That operation came to an end when the Shah betrayed the Iraqi Kurds and made a deal with Saddam. But Israeli-Iranian cooperation was almost restored after Saddam attacked Iran. In the course of that long and cruel war (1980-1988), Israel secretly supported the Iran of the ayatollahs. The Irangate affair was only a small part of that story. That did not prevent Ariel Sharon from planning to conquer Iran, as I have already disclosed in the past. When I was writing an in-depth article about him in 1981, after his appointment as Minister of Defense, he told me in confidence about this daring idea: after the death of Khomeini, Israel would forestall the Soviet Union in the race to Iran. The Israeli army would occupy Iran in a few days and turn the country over to the much slower Americans, who would have supplied Israel well in advance with large quantities of sophisticated arms for this express purpose. He also showed me the maps he intended to take with him to the annual strategic consultations in Washington. They looked very impressive. It seems, however, that the Americans were not so impressed. All this indicates that by itself, the idea of an Israeli military intervention in Iran is not so revolutionary. But a prior condition is close cooperation with the US. This will not be forthcoming, because the US would be the primary victim of the consequences. IRAN IS now a regional power. It makes no sense to deny that. The irony of the matter is that for this they must thank their foremost benefactor in recent times: George W. Bush. If they had even a modicum of gratitude, they would erect a statue to him in Tehran's central square. For many generations, Iraq was the gatekeeper of the Arab region. It was the wall of the Arab world against the Persian Shiites. It should be remembered that during the Iraqi-Iranian war, Arab Shiite Iraqis fought with great enthusiasm against Persian Shiite Iranians. When President Bush invaded Iraq and destroyed it, he opened the whole region to the growing might of Iran. In future generations, historians will wonder about this action, which deserves a chapter to itself in "The March of Folly". Today it is already clear that the real American aim (as I have asserted in this column right from the beginning) was to take possession of the Caspian Sea/Persian Gulf oil region and station a permanent American garrison at its center. This aim was indeed achieved - the Americans are now talking about their forces remaining in Iraq "for a hundred years", and they are now busily engaged in dividing Iraq's huge oil reserves among the four or five giant American oil companies. But this war was started without wider strategic thinking and without looking at the geopolitical map. It was not decided who is the main enemy of the US in the region, neither was it clear where the main effort should be. The advantage of dominating Iraq may well be outweighed by the rise of Iran as a nuclear, military and political power that will overshadow America's allies in the Arab world. WHERE DO we Israelis stand in this game? For years now, we have been bombarded by a propaganda campaign that depicts the Iranian nuclear effort as an existential threat to Israel. Forget the Palestinians, forget Hamas and Hizbullah, forget Syria - the sole danger that threatens the very existence of the State of Israel is the Iranian nuclear bomb. I repeat what I have said before: I am not prey to this existential Angst. True, life is more pleasant without an Iranian nuclear bomb, and Ahmadinejad is not very nice either. But if the worst comes to the worst, we will have a "balance of terror" between the two nations, much like the American-Soviet balance of terror that saved mankind from World War III, or the Indian-Pakistani balance of terror that provides a framework for a rapprochement between those two countries that hate each other's guts. ON THE basis of all these considerations, I dare to predict that there will be no military attack on Iran this year - not by the Americans, not by the Israelis. As I write these lines, a little red light turns on in my head. It is related to a memory: in my youth I was an avid reader of Vladimir Jabotinsky's weekly articles, which impressed me with their cold logic and clear style. In August 1939, Jabotinsky wrote an article in which he asserted categorically that no war would break out, in spite of all the rumors to the contrary. His reasoning: modern weapons are so terrible, that no country would dare to start a war. A few days later Germany invaded Poland, starting the most terrible war in human history (until now), which ended with the Americans dropping atom bombs on Hiroshima and Nagasaki. Since then, for 63 years, nobody has used nuclear weapons in a war. President Bush is about to end his career in disgrace. The same fate is waiting impatiently for Ehud Olmert. For politicians of this kind, it is easy to be tempted by a last adventure, a last chance for a decent place in history after all. All the same, I stick to my prognosis: it will not happen. Let us hope that history does not repeat itself (it has tendency to do that unfortunately especially when people forget it) and Mr. Shalom's prediction does not resemble that of Mr. Jabotinsky.